Card One International offers payment processing you can depend on ! * "GUARANTEED LOWEST RATES ! !" Card One International is a full-service independent banking operation providing credit card processing and related electronic payment services to merchants throughout the United States, and cardholders Internationally that buy from our merchant customers. At Card One International, we understand that your payment processing is part of what makes your business successful. Card One helps you maximize your success by providing the highest level of customer service while offering the lowest possible rates. Card One International is #1 in Payment Processing ! ! 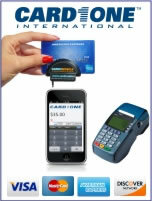 Card One International: Credit Card Processor assisting anyone who has an existing or new business accept credit cards . Charge One, Online Processing Gateway: Charge 1 is an online gateway allowing merchants to accept credit cards online from anywhere in the world . Card One International , Check Processing Division: Cheque 1 is our own check processing division allowing our merchants to accept checks from their customers and having them electronically deposit . Card One International , Cash Advance Program. We offer small/medium size loans to our merchants. When you process with Card One International, you may be eligible for a loan up to $500,000 . Lowest rates, Best quality Service, No Contracts! As a previous business owner of 17 years, I know how the credit card fees could dive into your monthly sales, and how other companies might lock you in unfavorable contracts. Once I find out what platform works best for my clients, I can place them through either, First Data, Paymentech, Elevon, or TSYS. Same rates, with the right software and the processor for my client’s business. As a broker, I don’t have an exclusive contract with any processors that I represent, and can set my own pricing for my clients. I sell the terminals to my clients at wholesale price and pass the savings to them. - Accounts are month to month with no cancelation fees. - By opening a merchant account with us, we will give you a free $200.00 Wavespot social media router for your business to keep with no strings attached. - If you’re in a contract with another company and you want to switch your account with us, we can pay your cancelation fees up to $500.00. Give us a call…. and let us help your business to grow! My business has tremendously grown with referrals from satisfied clients. Your satisfaction is guaranteed! Ask me if your business qualifies for a free Wavespot Router!